As today is Wednesday, I thought I’d join onto WIP (Work In Progress) Wednesday and share a few of my current knitting projects. For a few weeks I’d been good about sticking to one project at a time, but now I have 5 totals WIPs. First up, due to be finished soon, as all I have left are the arms and button bands, is the striped cardigan I’m making for Zachary. I also plan to make a matching one for Simon. This picture was actually taken last week, so just imagine the body being done! It is made out of Cascade yarn and the pattern is available on Ravelry. I usually keep a project in the car, so that if I’m waiting somewhere or Dave is driving I have something to work on. This one is a shawl / scarf made out of my favorite yarn, Wollmeise. The pattern is available here. I have two other Wollmeise projects going on – one is a pair of socks for a friend and the other is a another just started scarf, but I don’t have pictures of those. My last WIP is the most embarrassing, as it’s been on the needles for over a year. I used to work on it while watching TV, but somehow got out of the habit, and it’s been sitting in a bag for quite awhile. I’d say it’s about halfway done, but won’t be getting finished until I work on it! I’m not sure you can tell from the picture, but it is going to be an afghan. 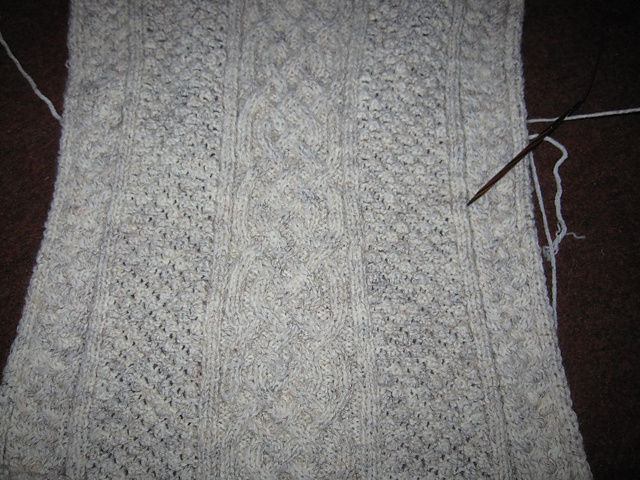 The pattern is made up of cables and bobbles and takes time to work. It is made in three panels and then seamed. I’m in the middle of the 2nd panel and the picture shows the first panel. I have shared a lot of finished objects (FOs) on my facebook page, but maybe soon I’ll share them here too. Thanks for reading! Previous Post What about kosher food?